Man, we love the Fillmore! 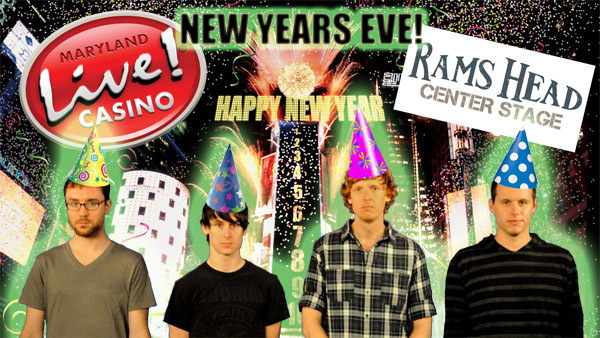 New Years Eve at Maryland Live! Discount tix thru 12/20! Join us on New Years Eve this year for the best party in town! 90's jams, open premium bar, hors d'oeuvres, and of course a champagne toast at midnight. DJ Kid AV late night! Let's do it! Get your tix here! Check out some highlights from the high point of our summer - playing Baltimore Magazine's Best of Baltimore Party at the Hippodrome! Best of Baltimore - Thank you & a deal below! ...we are CRAZY EXCITED to tell you that your voting has paid off in a huge way for us - we were asked by the magazine to be the exclusive party band at this year's Best of Baltimore Party! On Thursday, August 16th we'll be rocking the Hippodrome Theatre with the best of the 90's - and we want you to be there! As a special perk for Rollerblades fans, you can get $5 off the ticket price when you purchase online at http://www.baltimoremagazine.net/bestofparty/. Just click on "Enter promotional code" in the ticket window and type TC38. You should see the price adjust right away before you checkout. Thanks for believing in us! We can't wait to party with you this summer. Hey friends. Isn't it a TRAVESTY that 90's music hasn't had its day in the sun since, well, the 90's? We all know it's overdue, and for the past year Rollerblades has been doing our best to bring about the 90's renaissance. First Baltimore. Next, the world! Wouldn't it be awesome if we could jumpstart this inevitable triumph by taking Baltimore Magazine's "Best Band" in their 2012 Reader's Poll? Well we're about to blow it up like Bruce Willis on the Armageddon asteroid. To do the impossible, we're going to need your help! Please support us by going to www.baltimoremagazine.net/bestofpoll and writing in Rollerblades as Best Band. Every vote counts, and even if we don't win (oh, but we WILL) we'll get the attention of the magazine! Deadline is June 15th - vote today and spread the word! Hey everybody! The last few weeks have had some incredible 70 degree days, and you know what that means - we're just around the corner from awesome summer shows! We're especially excited for what's gonna be an insane night at Fager's Island in Ocean City on CINCO DE MAYO!!! 2012 will be out first full spring and summer schedule as a band and we're real excited to see you out there. If you haven't already, make sure to check out our Facebook page and click 'Like' - we announce all the details of our shows there and make sure to provide some links to nostalgic nuggets from the 90's from time to time. Oh, and what kinds of new songs are we playing these days? Glad you asked! Check out the updated song list HERE and be sure to send in your requests using the form to the right! An entire decade in one poster. How many images do you recognize? We are the lyrical gangstas! Hey everybody! Testing out our new blog feature for the first time! We can't believe the year we had in 2011 that all started with a simple email exchange about putting together a 90's cover band. 12 months later we've had a chance to party with lots of old and new friends at a bunch of shows, reliving all the songs we grew up on. Our calendar is getting booked quick for this new year, and you'll always be able to see a list of our upcoming shows here on this website as well as on our Facebook page. In the meantime, check out some fun video highlights of our December 9th show at Padonia Station and make plans to join us there again on Saturday, January 21, 2012! We are Rollerblades, your favorite all-90s cover band.